Legendary self-taught, left-handed guitarist Jimi Hendrix was born and raised in Seattle, Washington, the son of Lucille Jeter Hendrix and Al Hendrix. Jimi grew up in poverty but he loved science fiction, art, nearby Lake Washington and music, especially the R&B masters, Chuck Berry and Ray Charles. By high school he was an accomplished guitarist. Hendrix left high school to join the 101st Airborne so he could jump out of airplanes. After his stint with the U.S. Army Jimi resumed his musical career and eventually played with some of the best rhythm and blues bands in the U.S. at the time. In early 1964 he moved to New York, was hired by the Isley Brothers, and then he toured with Little Richard and Ike and Tina Turner. By 1965 he set off on his own as Jimi James and the Blue Flames. Hendrix applied blues harmony to rock progressions and played psychedelic rock solos in the middle of blues classics. By 1966 he had mastered techniques of sound distortion by using a fuzz box that made a “light string sound heavy and a heavy string sound like a sledgehammer” and by overdriving his amplifier. He played the guitar with his teeth, behind his back and under his legs. In September 1966, Jimi went to London where he became an overnight success. The Jimi Hendrix Experience was formed with Mitch Mitchell on drums and Noel Redding on bass and they quickly gained fame in Europe. Jimi’s sensational performance at the Monterey Pop Festival in June 1967 made him a rock star in the U.S. On their first American tour in 1968, the Experience played 49 cities in 51 days. They released three full albums: Are You Experienced?, Axis: Bold as Love and Electric Ladyland. Hendrix recorded a live album, Band of Gypsys, with Billy Cox and Buddy Miles. 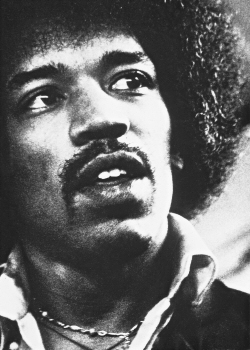 Jimi will be remembered for his daring rendition of “The Star Spangled Banner” at Woodstock in 1969, called “the greatest moment of the sixties” by Al Aronwitz, pop critic of the New York Post. Although his musical roots were in R&B and blues, Hendrix became a pioneer innovator in psychedelic rock and was embraced by a huge white audience. Hendrix died in his sleep in London on September 18, 1970. Charles R. Cross, Room Full of Mirrors, A Biography of Jimi Hendrix (New York: Hyperian, 2005); Mary Willix, Jimi Hendrix Voices from Home (Seattle: Creative Forces Publishing, 1996); Bill Milkowski, “Jimi the Composer,” Guitar World, March 1988; James A. Hendrix, My Son Jimi (Seattle: AIJ Enterprises, 1999); Harry Shapiro & Caesar Glebbeek, Electric Gypsy, (New York: St. Martin’s Press, 1990); Nelson George, The Death of Rhythm and Blues (New York: Pantheon Books, 1988).